Learn how a participant can pay their balance due after paying an initial deposit. 1. You will receive an email from the organizer. The email will have a big button "Pay Balance Due". Just click on the button, sign in to your WeTravel account and you will be redirected to the payment page for your balance due. 2. You can at anytime sign in to wetravel.com and pay your balance there. Click on "My Trips". Then click on "Manage Booking"
Then click on "Pay Balance Due" on the right side of the screen. You are now on the payment page to pay your outstanding balance. 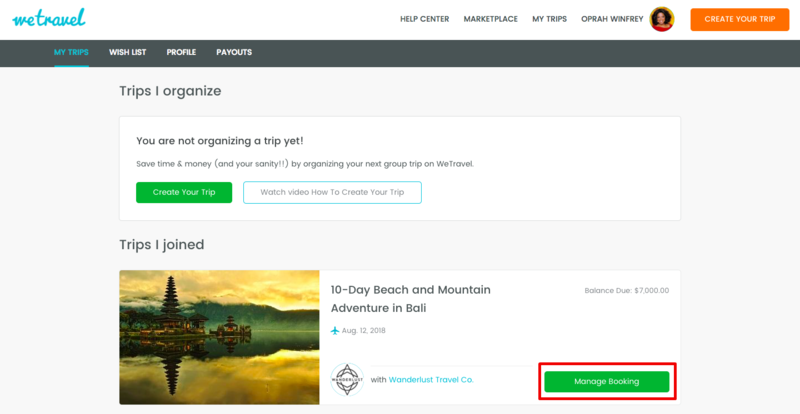 Select a saved payment method or enter a new one and click "Confirm Booking"
Click here if you paid for a trip but can't find your booking in your WeTravel account. Click here to learn how to pay for your next installment.